Saroja is a fairly standard thriller with a decent dose of dramatic tension thanks to some very good performances and loads of visual flair. I ordered the Tamil DVD but was sent the Telugu dub, which apart from the obvious difference also cast Srihari instead of Jayaram in a pivotal role. I quite like Srihari as an actor, and as I speak neither language subtitles are subtitles, so I was happy enough. I’ll be referring to characters by their names in the Telugu version. Prakash Raj is Viswanatham, a successful Hyderabadi businessman. He is a self centred man, in an uneasy marriage and not giving his teenage daughter Saroja as much attention as he gives his breakfast. That is until Saroja (Vega), is kidnapped. It’s one of my favourite Prakash Raj performances as he conveys fear, despair and regrets with only a scant amount of dialogue. His reactions and expressions are just perfect. There is a scene where he and his wife are watching home movies of Saroja. They can’t look at each other as they have an intimate conversation that is realistically awkward and painful. The depth of characterisation established so simply helped me care about what happened to Saroja since it meant so much to her father. Saroja gets an intro song about girl power and the evils of alcohol, which she delivers after sneaking out of her window to get to the gig. She is largely absent until late in the film as the drama is centred on the police operation to find her, but her character is established as resourceful and independent. 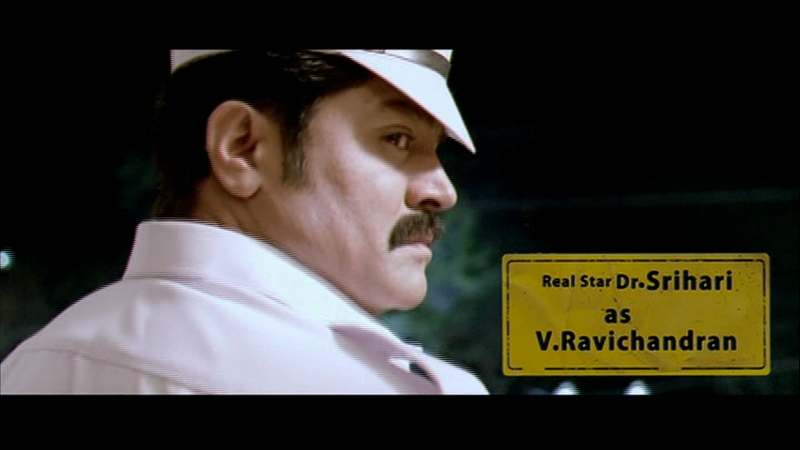 Srihari is Viswa’s friend Ravi, a charismatic policeman who takes on this very personal case. Srihari running isn’t exactly a greyhound so the chase scenes had me worried, but he is an authority figure and pillar of strength. Ravi orchestrates the police activity to recover Saroja and is on hand to witness the devastating effect the kidnapping has on his friend. There is a bit more complexity to his role than just a standard crusading cop though and Srihari and Prakash Raj share some excellent eye to eye moments. I don’t really buy his excuse for something he does, but it wasn’t a big deal overall. There is a second storyline that will collide with the straightforward police procedural. It centres on a group of friends, totally unrelated to Viswanatham and his concerns. Vaibhav is Rama Swamy. The girl he loves (Kajal Aggarwal in a brief appearance) gets engaged to his friend Ajay. He is trying to make the best of his lot and comes across as a moody but not unpleasant guy. Ajay (Shiva) is a soap actor who thinks he is a little more special than he is, and tries to get by on what he considers to be charm. He gets some of the better intentionally funny lines as he cites his TV serial commitments as a reason for avoiding anything he doesn’t want to do. Rama’s older brother Renga Swamy (SP Charan) is the average guy – happy, married with a daughter, middle class, comfortably podgy. Premji Amaren (brother of the director) is the comic relief, Ganesh, and almost every time he opened his mouth I wanted to kill him. To be fair, his straight dramatic scenes were good and a few of the jokes were funny. Every time he saw a pretty girl, badly dressed angels would cavort around her, and the angels got grumpier as they had to keep reappearing for different girls. But the comedy track mostly involved Ganesh acting stupid and grimacing wildly. If you find a man screaming his lungs out at the sight of a rat, or telling everyone loudly why he has to be quiet, funny maybe you’ll like him more than I do. The boys set out on a roadtrip from Chennai to Hyderabad to go to a one day match. After driving for a few hours, including about 257 snack and pee breaks as well as a run in with Brahmi, they are delayed by a major road accident and decide to take an alternate route. The storylines intersect when the guys take a wrong turn in the dark and end up in a spooky factory complex occupied by the imposing Sampath (Sampath Raj) and his gang, who have Saroja captive. The adrenalin rises from this point until the film’s conclusion as the boys try and extricate themselves from their perilous situation and accidentally seem to be rescuing the girl. There is always time for a dance break though! Kalyani (Nikitha) and Sampath entertain the troops and I have to say seeing all the bad guys in a dance number was a lot of fun. The ‘heroes’ and the baddies are ordinary guys and the fights and chases are consistent with that. There are no amazing flying leaps and stunts, but there is a strong feeling of the fear and effort in those scenes which is amplified by the lighting and composition of the shots and Saravanan’s cinematography is impressive. Even when things got less believable, the characters remained true to themselves and didn’t develop superpowers. There is some question in my mind as to how well these guys could navigate an unfamiliar place in the dead of night, but whatever. I thought Vega was convincing and in most scenes looked like a school girl. There were signs of a romantic attraction between her and Ram that I thought was a bit not right in view of their character ages. It’s just a fleeting thing but was it necessary for it to be there at all? The Yuvan Shankar Raja (Venkat Prabhu’s cousin – what a family) soundtrack is good and the range of musical styles supports the full span of the drama. While the songs are well placed in the story, I’m not sure all the picturisations were necessary. The montages sometimes caused a break from the overall mood as they were even more stylised than the rest of the film. The direction relies on gimmicks but that visual interest and excitement helped to give a standard plot a bit of freshness. The story doesn’t completely rely on the visuals so I didn’t feel it was too glossy for its own good. The performances, especially Prakash Raj’s, are compelling on their own. It’s a film where the outcomes probably won’t surprise anyone, but the way those things happen might. If you want a modern looking comedy/drama/thriller that’s not too heavy on gore and showcases some good character actors, give this a go. 4 stars! Heather says: Saroja has all the right ingredients to make a good film with an interesting story, excellent cast lineup and snappy dialogue. But it suffers a little from a very long set up with perhaps too much detail in some scenes and not enough in others. There are also a few scenes where the action takes place in poorly lit sets and I found it very hard to tell what was going on. However, once past the slow beginning, it’s a very enjoyable watch as it blends comedy with action and drama in a way that is rare in Tamil cinema. I do like the way the action is preceded with a date and time stamp in the opening sequences as it gives the feel of an American cop show and plants the idea that time is important. Although perhaps this isn’t followed up quite as well in later scenes. The introductions to the various characters are generally good, but I would have preferred director Venkat Prabhu to spend a little more time with Saroja’s family. It is clear that Viswanathan is caught up in his work and doesn’t have time for his daughter, but I think a little more information about the family dynamic would have made their characters more sympathetic. 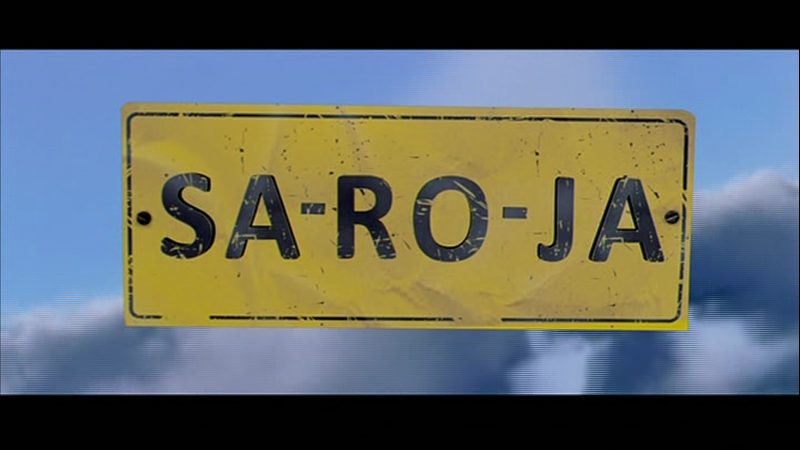 It took more time to get a feel for Saroja and her father as a result, although this may very well have been intentional, as we learn about the family as the film goes on, just as the four friends do. The interaction between the friends is well done, and feels very realistic. Perhaps it’s not quite as realistic though that they remain undiscovered sneaking around the bad guys’ lair with all of their arguing and long conversations. But the comedy in these was good and the story was well played out in these scenes. The action sequences, at least those that are visible, are also well choreographed and there are some really good ideas in the execution of the various fight sequences. I liked the twist at the end which I did not see coming at all, although I thought the justification by the villain was rather weak. In it for the money alone might have worked better, but it was still a good ending. I also enjoyed the comedy with Ganesh seeing angels appearing around pretty girls. All of the four characters worked well for me as they each had some endearing character traits and some really off-putting ones – just like in real life. They seemed like much more normal guys than typical filmi heroes which makes the film more interesting to watch. This is the first of Venkat Prabhu’s films I’ve seen and it’s inspired me to find his others. I’d say skip over a lot of the set-up and then sit back to enjoy a really good action comedy. 3 ½ stars. This entry was posted in Kollywood, Tollywood and tagged Kajal Agarwal, Nikitha, Prakash Raj, Premji Amaren, Sampath Raj, Saravanan, Saroja, Shiva, SP Charan, Srihari, Tamil, Telugu, Vaibhav, Vega, Venkat Prabhu, Yuvan Shankar Raja. Bookmark the permalink. 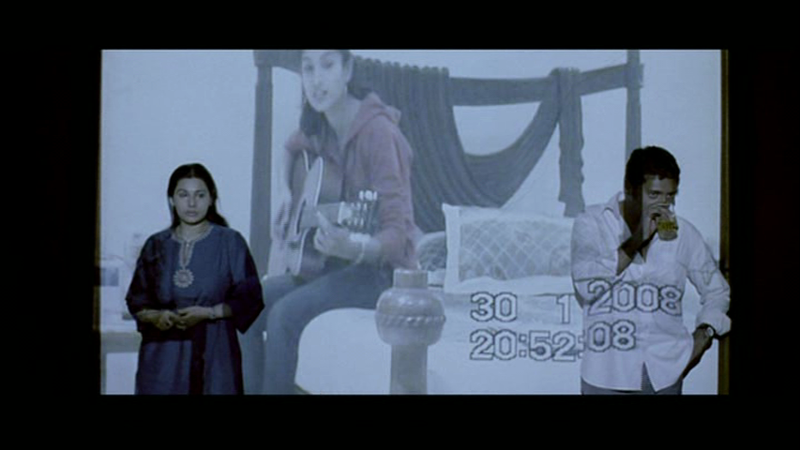 I liked the other old song flashbacks that Ganesh had when he was getting emotional too. What did you think of the film? I’m intrigued that there’s a Telugu version, and I’m curious to see how they edited in Srihari’s scenes. Also, it seemed like there were a lot of Telugu-Tamil regional jokes in the Tamil version–I wonder how they adapted those. I’ve liked Venkat Prabhu’s other films, and Mankatha is actually playing here next weekend. I’d recommend “Goa”- Sampath Raj is great in a different role. Premji definitely plays the same type of character, but in Goa he has a storyline that I thought was sort of sweet, and probably predisposed me favorably towards him. Hi Liz. 🙂 A few of the scenes with Srihari were re-shot but a lot took advantage of the visual effects as he appeared in grainy flashbacks , or in split screens and cutaway shots. So although I knew it was a dub and he was added for the Telugu market it worked quite smoothly. 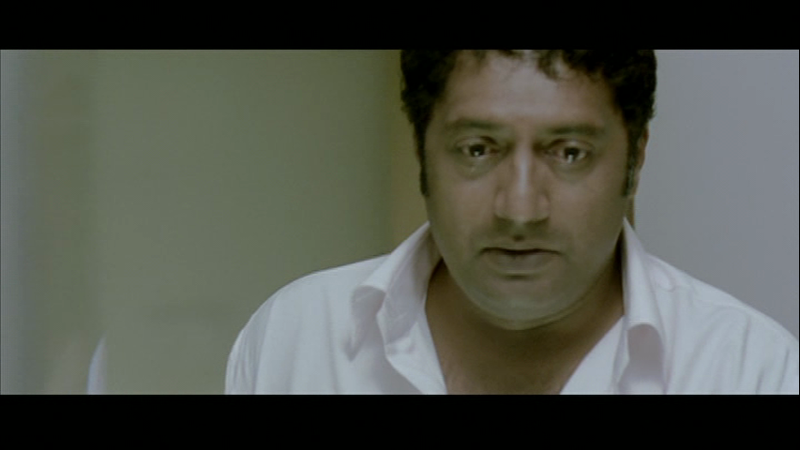 I ended up with so many screencaps of Prakash Raj it’s ridiculous. He was amazing, his expressions were so nuanced and just perfect. He enriched that fairly ordinary character so much. I’m hoping to see Mankatha in India as I don’t think I’ll have time to see it here before I leave. Interesting to hear that you recommend Goa which I added to my wish list after watching this. I did really like Premji here. I thought he was really funny and enjoyed his character, so will definitely go ahead and watch Goa soon – thanks!